I admit, my head is easily turned by clever packaging. 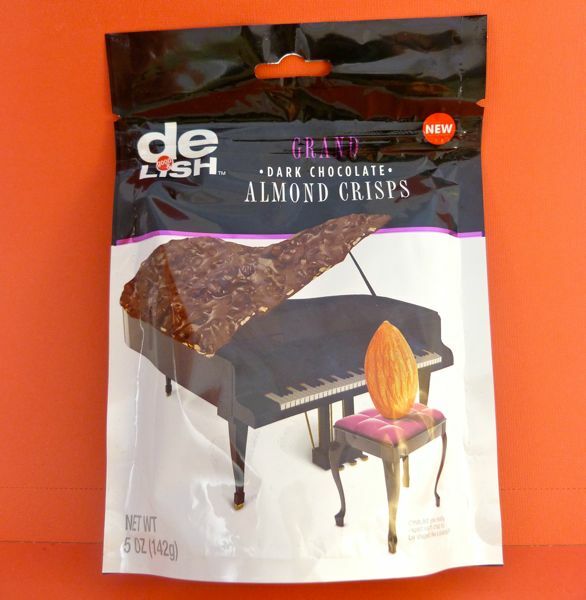 When I spotted a magical nut (almond) sitting upright on a pink-cushioned, black laquered piano bench, poised to play a grand piano with a lid made of dark chocolate, I thought to myself: you don't see that every day. 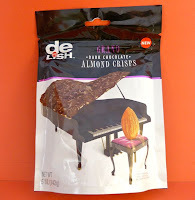 So, I couldn't resist picking up a package of Good and Delish Dark Chocolate Almond Crisps (distributed by Walgreen Co.) from a local Walgreens store. "*c'mon, did you really expect each crisp to be shaped like a piano?" Today was Day #7 of Chocolate and Music/Audio Theme Week, and Day #1 of Chocolate and Almond Theme Week. Note: There were so many great ideas and submissions for Chocolate and Music Theme Week, that I will surely have another similar theme week soon. I'm hoping someone will compose a short (20-second) piece inspired by a piece of chocolate. Ideas welcome.